Home / Grant Louie, M.D., M.H.S. About Grant Louie, M.D., M.H.S. Certolizumab pegol (Cimzia®) gained FDA approval in September/October 2013 for two new indications, adults with active psoriatic arthritis (PsA) and adults with active ankylosing spondylitis (AS). Already approved for adults with Crohn’s Disease and Rheumatoid Arthritis, certolizumab pegol (CZP) is a humanized TNF-α monoclonal antibody. In the RAPID-PsA study, a 24-week, phase 3 double-blind, randomized, placebo-controlled trial of adults with active PsA (≥3 tender joints, ≥3 swollen joints, C-RP > 7.9 mg/L or ESR ≥ 28 mm/hr) for ≥ 6 months and fulfilling the CASPAR criteria with previous failure of ≥ 1 DMARD) and active or documented history of plaque psoriasis, subjects (N=409) were randomized (1:1:1) to receive placebo or CZP 400 mg at weeks 0, 2, and 4 followed by either CZP 200 mg every 2 weeks or CZP 400 mg every 4 weeks thereafter. The primary study endpoint was ACR20 response at week 12. A significantly higher proportion of patients in both active treatment groups achieved an ACR20 response at week 12 compared to placebo (52% in the CZP 200 mg Q2 weeks, 58% in the CZP 400 mg Q4 weeks, 24% in placebo, p<0.001). Efficacy was maintained through week 24. Subjects assigned to placebo who failed to attain a pre-specified 10% improvement in the total number of tender and swollen joints at week 16 underwent early escape and were re-randomized to receive CZP 200 mg Q2 weeks or CZP 400 mg Q4 weeks. Active plaque psoriasis improved significantly among those who received CZP, with 46% among the 200 mg Q2 weeks group and 47% among the 400 mg Q4 weeks group achieving a PASI75 at week 12 compared to 14% among placebo (p<0.001). Efficacy for both the ACR20 response and PASI75 was maintained through 24 weeks. Concomitant DMARD use, most frequently methotrexate, did not appear to impact response to CZP. Dactylitis and enthesitis were both significantly improved in subjects receiving CZP as compared to placebo. Risk of adverse events, including upper respiratory tract infection and diarrhea, was similar between all groups through 24 weeks. There were 2 deaths in the CZP groups (1 myocardial infarction, 1 unknown cause) during the study, both considered by the investigators to be unrelated to study drug. In the RAPID-axSpA study, a 24-week, phase 3 double-blind, randomized, placebo-controlled trial of adults with axial spondyloarthritis (axSpA) including ankylosing spondylitis (AS). All participants had chronic inflammatory back pain for ≥ 3 months, fulfilling the ASAS criteria for axSpA, with active disease defined by BASDAI ≥ 4 and spinal pain ≥ 4 on the 0-10 Numerical Rating Scale, along with C-RP > 7.9 mg/L and/or sacroiliitis on MRI. Eligible participants must have had inadequate response to at least 1 NSAID for ≥ 30 days or 2 NSAIDs for ≥ 2 weeks each. A pre-specified number (≤ 40%) of patients could have received treatment with an anti-TNF agent > 3 months prior to baseline. To ensure a balanced study population of patients, approximately 50% of axSpA patients fulfilled mNY criteria for AS. Subjects (N=325) were randomized (1:1:1) to receive to placebo or CZP 400 mg at weeks 0, 2, and 4 followed by CZP 200 mg Q2 weeks or CZP Q4 weeks thereafter. The primary study endpoint was ASAS20 at week 12. A significantly higher proportion of patients in both active treatment groups achieved an ASAS20 response at week 12 compared to placebo (57% in the CZP 200 mg Q2 weeks, 63% in the CZP 400 mg Q4 weeks, 38% in placebo, p=0.004 and p<0.001, respectively). Efficacy was maintained through 24 weeks. Secondary endpoints, including BASFI and BASMI for physical functioning and spinal mobility, respectively, were significantly improved among active treatment groups compared to placebo. ASDAS, a disease activity measure for axSpA, was also significantly improved among the active treatment arms compared to placebo at weeks 12 and 24. In subgroup analyses, treatment effect of CZP was similar among patients with AS and non-radiographic axSpA. Risk of adverse events, including nasopharyngitis and upper respiratory tract infection, was similar between all groups through 24 weeks. There was an increased risk of elevated CPK in the CZP groups compared to placebo (5.1% vs. 1.9%, respectively). The CPK elevation, which was transient and promptly resolved, was considered by the investigators to be associated with increased physical exercise. There were no reported deaths in the study. Mease PJ, Fleischmann R, Deodhar AA, et al. Ann Rheum Dis 2013 Oct 16. [Epub ahead of print]. Landewe R, Braun J, Deodhar A, et al. Ann Rheum Dis 2013 Sept 6. [Epub ahead of print]. ***The information above will be amended as necessary, pending presentation of additional, pertinent study data at the 2013 ACR Annual Scientific Meeting in San Diego, CA from October 27-30, 2013. 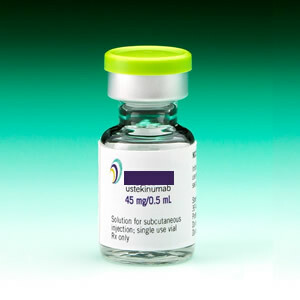 Ustekinumab (Stelara®) received FDA approval in September 2013 for a new indication of the treatment of adults with active psoriatic arthritis (PsA), alone or in combination with methotrexate. Already indicated for the treatment of adults with moderate-to-severe plaque psoriasis, ustekinumab is a human IgG1κ monoclonal antibody against the p40 subunit of IL12/23. In the pivotal PSUMMIT 1 trial, a phase 3, multicenter, randomized controlled trial of adults with active PsA (≥ 5 tender joints, ≥ 5 swollen joints, C-RP ≥ 3.0 m/L, and active or documented history of plaque psoriasis) fulfilling CASPAR criteria, subjects (N=615) were randomized (1:1:1) to receive ustekinumab 45 mg, ustekinumab 90 mg, or placebo subcutaneously at weeks 0, 4, and then every 12 weeks thereafter. The primary study endpoint was ACR20 response at week 24. A significantly higher proportion of patients in both active treatment groups achieved an ACR20 response compared to placebo (42% in the ustekinumab 45 mg group, 50% in the ustekinumab 90 mg group, and 23% in placebo, p<0.0001). Efficacy was maintained through week 52. Subjects assigned to placebo and who then crossed over to active drug (ustekinumab 45 mg or 90 mg) at week 16 were able to attain a similar ACR20 response at week 52 compared to those who received active drug throughout. Active plaque psoriasis improved significantly among those who received ustekinumab, with 57% among the 45 mg group and 62% among the 90 mg group achieving a PASI75 compared to 11% among placebo (p<0.0001). Dactylitis and enthesitis were both significantly improved in subjects receiving ustekinumab as compared to placebo. Risk of adverse events, including nasopharyngitis, upper respiratory tract infection, headache, and fatigue, was similar for all groups. Before starting treatment with ustekinumab for PsA, patients should be screened for TB. The recommended dose is 45 mg subcutaneously at weeks 0, 4, and then every 12 weeks thereafter. For those with co-existing moderate-to-severe plaque psoriasis weighing > 100 kg, the recommended dose is 90 mg at the aforementioned time intervals. McInnes IB, Kavanaugh A, Gottlieb AB, et al. Lancet 2013;382:780-9.